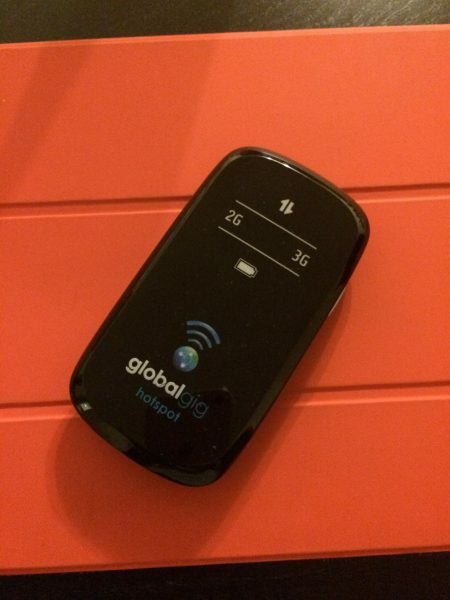 Few weeks back we talked about Voiamo’s two initiatives in the UK, Mobidata and Globalgig. Both offer data packages to both businesses and normal users, giving people the ability to travel across 40 countries with no roaming charges on the data. The packages are offered both as SIMs for your devices, or available as a hotspot device. 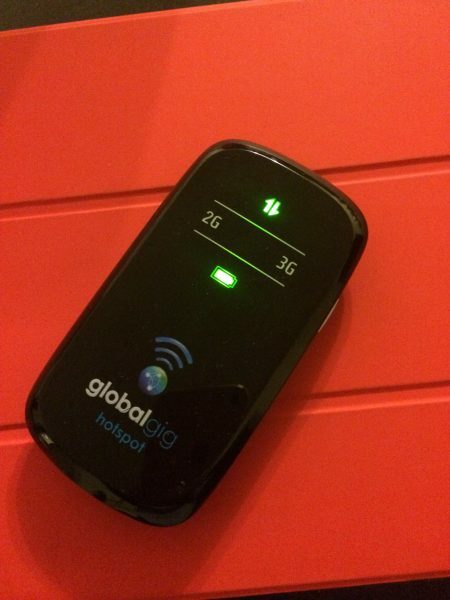 Today we’ll be looking at the Hotspot Device. This pebble shaped device fits quite snuggly inside the palm of your hand, or in your pocket. This makes it ideal as a travel partner. Very light, and a good finish means you won’t be hiding this away if you can help it. On the front are symbols that light up according to what service you’re receiving. These include data, battery, and a choice between 2G and 3G. While self-explanatory, the 2G/3G tells you about your reception, the data symbol tells you when you’re actually using the data, and the green light indicates a good battery, which turns red when the battery is low. Turn the unit around and you see nothing but a ZTE logo, telling you about the original manufacturer of the device. On one side is a power button, while the bottom shows a mini-usb charging point. Yeah, that is right. A mini-USB charging point, rather than a micro one. In the box you find the required charging cable and charger. Yes, while the world seems to have moved on from mini-USB on mobile devices, you still see it being used on SatNavs, as well as some hobbyist boards such as the ones us electronics engineers use. So yeah, your regular phone charger won’t work on this, but the mini-USB cables and connector’s aren’t quite as rare as one may imagine. As well as you’d really want it to be honest. This device offers a fairly reasonable range, and you can connect up to 5 devices on it. Your data rate obviously depends on how good your cellular data reception is, and the 2G/3G indicators give you a guidance on that. Since Voiamo have partnered with THREE in the UK, your reception is as good as Three’s. Which evidently is great up north, and has improved massively down south, but like all other phone services in the UK, can get patchy if you’re on the train or travelling. Yes, one of the things I noticed was that when the device was being used to say stream a video, it did get warm in my pocket. Noticeably so. Not hot, but warm. This tends to indicate that the battery is working hard, but the device kept going. Whether you call it a design feature or a fault, it is something to note. As far as usability goes, this device is pretty perfect. The only thing I could find wrong was the fact that it promises a battery life of four hours. While it delivers that, and does it quite well, 4 hours means that you only use this device when you really need to, and turn it off when you don’t. Accidentally leaving it on may mean that you may run out of juice. Prices start at £21/month. Remember that you’re paying for the ability to use data across 40 countries across the world, which covers most of Europe, and there are absolutely no roaming charges at all! It does what it says on the tin, and that is how we like our gadgets to be. Battery life leaves a little to be desired, perhaps a standby mode or something similar could have made this a sweeter deal. Either way, for the package, it still works great. Previous story Galaxy S5 available to pre-order from the 28th of March! What a terrible service !! after many requests to cancel my trial as the service very bad, they keep refusing to cancel the service as they say i have not paid the bill, taking money out of my account now two times in seven days and totalling over £100 and claim not to receive emails although in the process acknowledging the fact i don’t want their service and still keep charging, these are the worst providers i have ever seen.! !